Search for Elizabeth Fry in CBW. Find Elizabeth Fry on the Pop Chart. During the early decades of the nineteenth century, Elizabeth Fry was one of most famous women in London and her charitable influence extended across the United Kingdom and Europe. The first publicly recognized female philanthropist, she organized Ladies' Committees that fought to reform the appalling conditions of prisons. Beginning with the female inmates at Newgate Prison, she pioneered a system of discipline that aimed to rehabilitate criminals as productive members of society. Lionized in paintings as well as biographies, ubiquitously depicted in her Plain Quaker attire and often shown reading the Bible before a group of lower-class listeners, she built upon the legend of her heroic entry into the notoriously riotous women's quarters at Newgate. Contemporary collected biographies virtually canonized Elizabeth Fry, associating her with heroines such as Florence Nightingale, Grace Darling and the Maid of Saragossa as well as saints of old. However, more recent exposes, beginning with June Rose's biography published in 1980, reveal complex qualities in Elizabeth Fry that the nineteenth century biographies rather conspicuously suppressed. Elizabeth Gurney was born May 21, 1780 in a distinguished home on Magdalen Street in Norwich, an important center for England's prosperous cloth trade. Known in the family as Betsy, she was the fourth of twelve children born to John Gurney (1749-1809) and Catherine Bell (1754-1792). Her father was the heir in a family of successful wool merchants and a partner in Gurneys Bank. Socially established by wealth, both John and Catherine, great-granddaughter of the Quaker theologian Robert Barclay, were from old families in the Society of Friends. Popular and socially mobile within the community of Norwich, they followed the broad tenets of their inherited Quaker faith, but also enjoyed intellectual company and cultural pursuits outside of the ascetic restrictions of Plain Quakerism. The Gurneys attended weekly Meeting and Catherine read passages from the Bible to her children daily, while also instructing them in a worldly academic curriculum which included French, Latin, natural sciences, mathematics, modern history, geography, and the arts (Rose, 6). Betsy also was an acutely imaginative child, sensitive to her mother's gloomy dictation from the Old Testament. Her personal journal—Elizabeth Fry was a consummate diarist throughout her life—shows a child (one amongst ten now) desperate to mitigate or control her fears, wishing that "two large walls might crush us all together that we might die at once and thus avoid the misery of each other's death" (Memoir, 22). Her nervousness manifested in a terror of water, bathing, sudden noises and significantly, the dark. Betsy languished in “delicate health” and was unable to focus on her lessons, a marked outcast from her lively and adept siblings. She recalls: "Having the name of being stupid, really tended to make me so and discouraged my efforts to learn" (Memoir, 21). Her resistance and obstinacy became pronounced: "If I am bid to do a thing, my spirit revolts; if I am asked to do a thing I am willing" (Memoir, 36). Yet it is worth noting that years later, her system of discipline at Newgate would rest upon these two insights: Treating inmates as subhuman only perpetuates their degradation; and, most female prisoners will agree to a system of self-reformation if asked. Recasting Betsy's early flaws into tests of fortitude allowed editors to construct the adult paragon, Elizabeth Fry. As June Rose points out—from extensive research of original Fry manuscripts—her daughters also corrected the egregious spelling and grammatical errors that followed from her resistance to instruction. In her recent biography, June Rose reveals that these passions drove Elizabeth Fry throughout her life, yet short collective biographies account for this temperamental conflict as a stage in her development toward religious devotion. collective biographies that do provide a more complete picture of Elizabeth Fry’s struggle between worldly and religious influences still contain an element that appears across the board: all presenters in these collections mark an absolute reformation of character, so that the adult heroine retained no unworthy qualities. One significant figure in Betsy's path towards Plain Quakerism was William Savery, an American Quakerminister. Hearing him preach was a revelatory experience for the impressionable young woman: “Today I felt that there is a God—I have been devotional & my mind has been led away from the follies it mostly is wrapped up in—I loved the man as if he was almost sent from heaven—we had much serious talk & what he said to me was like a refreshing shower on parched up earth" (Memoir, 48). When Savery is discussed in contemporary biographies, her feelings about him become the proper response of a pupil. Yet June Rose calls it an “infatuation” with the married, middle-aged preacher, one that Betsy's sisters teased her about. During a trip to London, she contrived to see Savery, one morning even waiting in the parlor of the house where he was staying until she met him. Rose writes: “Through her journal in London runs the thread of William Savery and religion. She realized that the two were dangerously intertwined. . . . In religion she found an outlet for her highly emotional and hypersensitive nature but she had come to religion through a man” (24). This compromising piece of her religious enlightenment never emerges in nineteenth-century versions. Part of Betsy's development towards Plain Quakerism involved adopting the Society's strict rules for inner discipline, which prohibited dancing, singing and all ornamental attire. Her determination placed her at uncomfortable odds with her family, who found her refusal to join in with their pleasures irritating and disapproved of her obsession with religion. Instead, like many ladies of her class, she turned her attention towards the needs of the poor around her and opened a Sunday school where she read Gospel stories and gave lessons to local children. Betsy gradually adopted the outward appearance of Plain Quakerism, publicly wearing the cap (that would later be the distinguishing feature of her famed image) for the first time in 1799 at a party given by her cousins in London (Rose, 33). The hagiographical versions insist that Fry’s public act of embracing Plain Quakerism’s garb signaled her rejection of all selfish, materialistic pleasures. June Rose suggests otherwise. Fry, after purchasing extravagant cloth to make ordinary aprons, writes in her memoir: “It seems inconsistent to dress plain from principle and economy and then have my things so fine and expensive,” but according to Rose, Fry allowed herself to indulge in this contradiction between principle and practice all her life (35). She always wore dresses that appeared sober, being simple in design and muted in color; yet, less conspicuous to the eye, her clothing was made from the finest, most expensive fabrics. Rose notes that the characteristic brown silk shawl, which accompanied the famous cap, was lined inside with ermine (35). And Fry was certainly conscientious of her public appearance: when traveling through Europe as a celebrated philanthropist, a member of Fry's party sat on and disfigured her expensive, new Quaker cap, almost spelling disaster for the entire trip. Fortunately, some quick thinking ladies in the group managed to rescue the cap from its flattened condition (Rose, 188). On August 19th, 1800, after much deliberation about the conflict between religious calling and matrimonial duties, as well as a courtship lengthened by her own indecision, Elizabeth married Joseph Fry, a shy, complacent man from a wealthy Quaker family. It was at about this same time that she started to speak in Society Meetings and read aloud from the Bible—developing the public voice that was key to her later ministry (in 1811 the Society formally acknowledged her as a Quaker Minister). This activity coincided and inevitably conflicted with twenty-two years of prolific childbearing: ten children between 1801 and 1816, and an eleventh in 1822. According to Rose, Elizabeth's journal reveals how unsuited she was to domesticity and childrearing, worldly concerns that she felt detracted from her true religious calling. While she expressed regret over her lack of sympathetic feeling as a wife and mother, her own talents and interests inclined toward public ministry. As she became increasingly devoted to philanthropic work, frequently traveling abroad on her mission to reform prison systems, Elizabeth left her family behind. Joseph Fry, weaker-willed than his determined wife, supervised the rearing of their youngest children while the older ones where sent to live with relatives. The children were ill-behaved and self-willed; later, Elizabeth would see all but one of them reject Quaker strictures by marrying outside of the sect. Although she was lauded for her public service, family members and Quaker Society friends criticized her for neglecting the domestic duties of marriage and motherhood. Rose bluntly analyzes Fry's conflict between private and public duties: “It was necessary for her to see her work as divinely inspired, for it was only through her religion, through her status as a Minister, that she could emancipate herself and leave the domestic sphere with any peace of mind”(92, emphasis added). Perhaps ungenerously, Rose asserts that Fry preferred public ministry because it attracted the attention of a rapt audience; having been desperate for notice as a child in a large family, she refused her own numerous children the attention they needed from her. The collective biographies avoid confronting any neglect the children suffered while their mother exerted herself in public philanthropy. Calling Elizabeth Fry a “ministering angel to her fellow-creatures,” Mossman's sketch focuses on her charitable labors, only alluding to the fellow-creatures of her own home in a final gloss: “She believed in some instances, her own amongst other, that, under the immediate direction of the Spirit of God, individuals were called to leave for a time their home and families, and devote themselves to the work of the ministry” (81). Mossman's comment has striking parallels to Rose, yet only the more recent biographer indicts Elizabeth Fry's personal motivations in her public calling and considers that her conscious choice to “emancipate herself” neglected her family’s development. The development of others, especially of female prison inmates, became Elizabeth's primary concern. In 1813, accompanied by Anna Buxton, she first entered Newgate Penitentiary, where she saw women, both hardened criminals and minor offenders, detained together with their innocent children. They perceived that the conditions—gambling, drinking and brawls between the women—only further degraded the morals of the inmates and corrupted their children's minds, whose first words were to repeat the vulgar language they daily heard. Immediately, she and her friend set to work providing much-needed clothing and clean bedding for the prisoners and Elizabeth read the Bible aloud to them during the visits. Four years later, she would return to Newgate with her mind set on reforming the conditions for female inmates and rehabilitating them by way of a radical system of discipline. In a move that was extremely progressive for the time, Elizabeth addressed the women directly and asked for their consent before instituting her new system, which set up schools and provided inmates with paid labor opportunities. She allowed them to vote on the rules of discipline (which prohibited drinking and gambling) before they were adopted. The change she effected at Newgate won her public renown: turning a group of fallen women, once considered unruly beasts, into lady-like women who diligently applied their needles to sewing and knitting for an honest living. Biographers often link Elizabeth Fry’s reformation of Newgate with an emblem that was also applied to missionary martyr Ann Hasseltine Judson: the heroine carrying a civilizing light into darkness. The narrative effect of this emblem is heightened by a detail from Elizabeth’s journal: during her conversion, she tried to overcome her childhood fear of darkness, conditioning herself to the dark by remaining alone in rooms at night (Memoir, 84). The fable of Elizabeth Fry's entry into Newgate is lovingly retold by presenters who conflate details and heighten her heroism. Almost universally in these biographical fictions, she enters the prison alone, “her only shield her faith and purity—her sole weapons the charity that hopeth all things, believeth all things, and a copy of the New Testament opened in her hand” (Russell, 16-17). To the jailer who warned her not to go amongst the unruly women, or if she must, to leave her purse and watch in his safekeeping, she is said to reply “I am not afraid” (or, if scared, overcoming it with miraculous fortitude) and to show no concern about her valuables. Adams and Foster even write that such was the impression Elizabeth made on her first visit, “far from being robbed, when she dropped some article a woman ran after her to restore it” (16). According to Rose, Elizabeth did in fact leave her watch with the jailer for safekeeping (68-71). Nearly all accounts condense the first visit in January of 1813 with her later return at Christmas of 1816, presumably to create the idea of her immediate (and thus more heroic) intercession to alleviate the appalling conditions she found at Newgate. 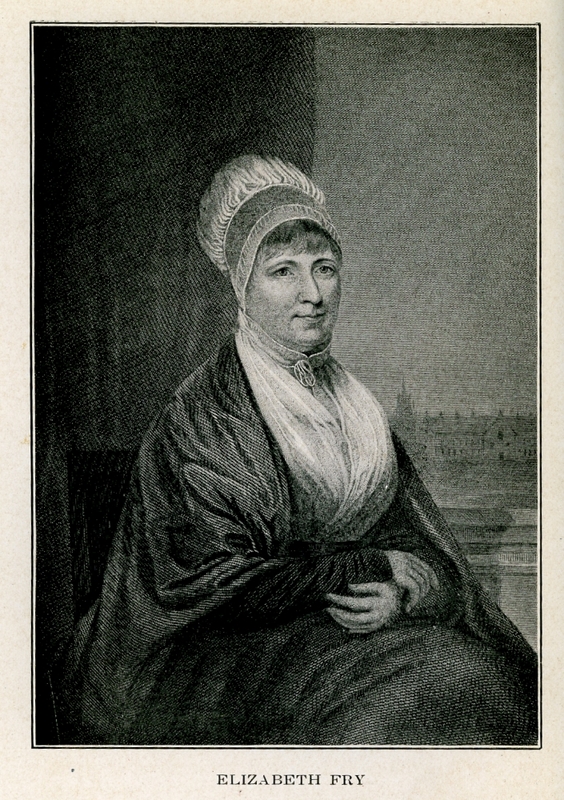 Elizabeth Fry's untiring reform work was heroic, without need to resort to eulogy. Defying the opinions of the male institutional leaders, she showed at Newgate that her compassionate system of discipline transformed inmates, and she pressed the Lord Mayor of London for its official adoption into the prison system (a move that guaranteed funding from the government). In 1818, she was the first woman asked to testify in the House of Commons, providing evidence from the Newgate system before a Committee on London Prisons. Elizabeth organized a women's group, The Association for the Improvement of the Female Prisoners in Newgate, and traveled across Britain encouraging socially prominent women to form their own local Ladies' Associations—in 1821 Elizabeth's Newgate organization was expanded into the British Ladies' Society for Promoting the Reformation of Female Prisoners, possibly Britain's first nationwide women's activist group (Haan, ODNB). Later in her career, she traveled extensively in Europe and influenced sovereigns and ministers to follow her ideas about improving prison conditions and rehabilitating inmates. Prison reform was not her only mission, although Newgate and her system of female discipline were what propelled Elizabeth Fry to public celebrity. collective biographies that compiled eminent figures into narratives of female heroism naturally focused on the legend of Newgate, an irresistible image of triumph. Yet Elizabeth Fry felt her calling in many other avenues: she extended her system of female discipline and schooling onto convict ships that transported exiled prisoners, and worked to ensure that these women had an honest means of supporting themselves in the colonies; she pushed for better treatment of confined lunatics and spoke out against the practice of solitary confinement; she campaigned against the death penalty and succeeded in its being abolished as a punishment for minor offenses; she used her influence to create temporary shelter where hundreds of paupers were housed and fed in the winter of 1819; she advocated for religious toleration; she established libraries for the edification of England's coastguard; she delivered innumerable religious tracts for the Bible Society; she established the Society of Nursing Sisters in 1840 and created a training school with the aim of reforming nurse work—a group of “Fry nurses” were amongst Florence Nightingale's party that went to Scutari during the Crimean War (Rose, 180). Elizabeth Fry is even considered today as a protofeminist, her call for the formation of Ladies' Committees being seen as a precursor to an organized women's movement (Haan, ODNB). Nevertheless, the commendation in collective biographies suppresses further aspects of Elizabeth Fry's life: on doctor’s orders, she took opium and drank alcohol daily and by the end of her life seems to have become heavily dependent; in 1828, John Fry's bank went under and he was disowned by the Society of Friends, while Elizabeth was accused of having drawn funds from her husband's bank to support her charities (Rose, 138-9). Yet not all that is conspicuously missing from the biographies concerns unpleasant details from her private life. No presenter takes notice of the public opposition her work received from later, secular men who were professionally engaged in reforming social policy. These male reformers passed over Elizabeth Fry's legacy as amateur charity work done by an old-fashioned, Plain Quaker woman (Haan, ODNB). Thus, the picture we have from contemporary biographies is double-edged. It may be a carefully-crafted figure of moral heroism, diminishing the full human being Elizabeth Fry. Yet, if these early biographers had not canonized her in print during the nineteenth century, her name and its connection to humanitarian reform might have been lost, trampled by the steady and impersonal march of “progress” in modern society. On October 13th, 1845, Elizabeth died after suffering a stroke. Over a thousand people attended the funeral held at the Quaker burial ground at Barking to pay their respects to this remarkable woman, a religious outsider yet of a prominent, wealthy family, who had become a saintly figure of pious dedication and compassionate philanthropy. The heroine Elizabeth Fry was not just a Christian worker who ministered to those she saw in need, but was publicly recognized as an influential prison reformer—at a time when it was unprecedented for a woman to be actively involved in structuring social policy. Adams, Elmer Cleveland, and Warren Dunham Foster. Heroines of Modern Progress. New York: Sturgis & Walton; Macmillan, 1913. Balfour, Clara Lucas Liddell. Moral Heroism; or, The Trials and Triumphs of the Great and Good. London: Houlston & Stoneman, 1846. Fry, Elizabeth Gurney, Katharine Fry, and Rachel Elizabeth Cresswell. Memoir of the Life of Elizabeth Fry: With Extracts from Her Letters and Journal. Vol. I & II. Philadelphia: J.W. Moore, 1847, 1848. Haan, Francisca de. "Fry , Elizabeth (1780–1845)." Oxford Dictionary of National Biography. Ed. H. C. G. Matthew and Brian Harrison. Oxford: OUP, 2004. Online ed. Ed. Lawrence Goldman. May 2007. Mossman, Samuel. Gems of Womanhood; or, Sketches of Distinguished Women in Various Ages & Nations. London and Edinburgh: Gall and Inglis, 1870. Rose, June. Elizabeth Fry. New York: St. Martin's, 1980. Russell, William. Extraordinary Women: Their Girlhood and Early Life. London: Routledge, 1857. Reading through the lens of June Rose's revealing 1980 biography to investigate revisionary practices in several contemporary versions of Elizabeth Fry's life. Website of the Canadian Association of Elizabeth Fry Societies, a group of organizations committed to advocating for women in the criminal justice system and providing resources for the rehabilitation of female prisioners. Includes a brief biography about Elizabeth Fry and information about CAEFS's annual "National Elizabeth Fry Week" to raise awareness about activites for reforming the conditions of female inmates. E.R. Pitman, Elizabeth Fry. Boston, Mass. : Roberts Brothers, 1886. Mrs. Emma R. Pitman's (author of Lady Missionaries in Foreign Lands) biography about Elizabeth Fry. This text is a volume in the Famous Women Series of biographies. Full-text version of the biography linked through Google Books and Internet Archive. Edward Ryder, Elizabeth Fry: Life and Labors of the Eminent Philanthropist, Preacher and Prison Reformer. New York: E. Walker's son, 1883. Edward Ryder's biography about Elizabeth Fry, based on entries from Fry's journal. This full-text edition includes Ryder's preface which discusses other authoritative biographies written about Fry. Text linked through Google Books. Elizabeth Gurney Fry, Katharine Fry, and Rachel Elizabeth Cresswell, Memoir of the Life of Elizabeth Fry: With Extracts from Her Letters and Journal. Vol. I & II. Philadelphia: J.W. Moore, 1847, 1848. Elizabeth Fry's memoir, written by herself and edited by her daughters. Text published in two volumes. Links to Vol. I and II accessed through Google Books. Francisca de Haan, "Fry , Elizabeth (1780–1845)." Oxford Dictionary of National Biography. Ed. H. C. G. Matthew and Brian Harrison. Oxford: OUP, 2004. Online ed. Ed. Lawrence Goldman. May 2007. Oxford Dictionary of National Biography entry on Elizabeth Fry written by Francisca de Haan. This comprehensive biographical record includes a list of other sources and archive materials related to Elizabeth Fry. Georgina Lewis, Elizabeth Fry. London, England: Headley Brothers, 1909. Full-text edition of Georgina Lewis's biography about Elizabeth Fry, including the author's preface and a chronology of milestones in Fry's life. Text linked through Internet Archive. Susanna Corder, Life of Elizabeth Fry: Compiled from Her Journal. Philadelphia: H. Longstreth, 1855. Susanna Corder's comprehensive biography about Elizabeth Fry, based on entries from Fry's journal. Includes Corder's preface in which the author presents this text as containing essential information not included in the Memoir of the Life of Elizabeth Fry. Full-text edition linked through Google Books.